Part two of Slow Robot's romp through Marvel UK's short-lived excursion into the US comic book market. Initially announced as the quarterly FRONTIER COMICS UNLIMITED. 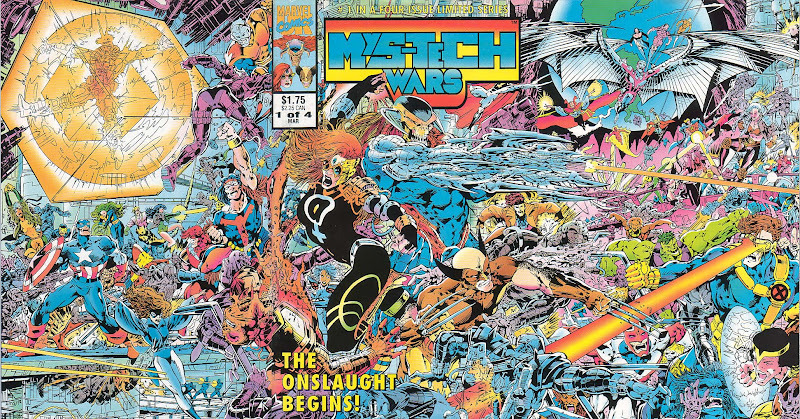 The series was cancelled before publication and the planned first issue printed as a stand-alone special. The new strips Evil Eye and The Fallen never graduated to solo titles and the Frontier imprint closed after the initial four limited series. Announced but subsequently delayed and then cancelled. The team did appear in other M-UK titles. Working title for OVERKILL and the initial five US stand-alone editions: HELL'S ANGEL, THE KNIGHTS OF PENDRAGON, MOTORMOUTH, WARHEADS and DIGITEK. Announced for 1993 but unpublished. Described by Michael Bennent (Frontier Group Editor) as “humour-orientated title about a big robot with big guns” (Interview in COMICS WORLD 17, July 1993). AKA HEAVY WEAPON (in cancellation announcement in COMIC WORLD 22, December 1993). The title changed to Dark Angel from issue 6 following a threat of a lawsuit from the Hell's Angel biker organisation. Hell's Angel was one of the founding OVERKILL strips. Marketing iniative for the launch of BLACK AXE, SUPER SOLDIERS and WILD THING (All April 1993). Referenced in COMIC WORLD 14 (April 1993). Published under the Frontier Comics imprint. Sporadically published: Issues dated September 93, October 93, January 94, March 94. Announced as a four-issue limited series. An assassin of mixed parentage (alien, animal and human) is doomed to perpetually wander the galaxy in search of potential victims. 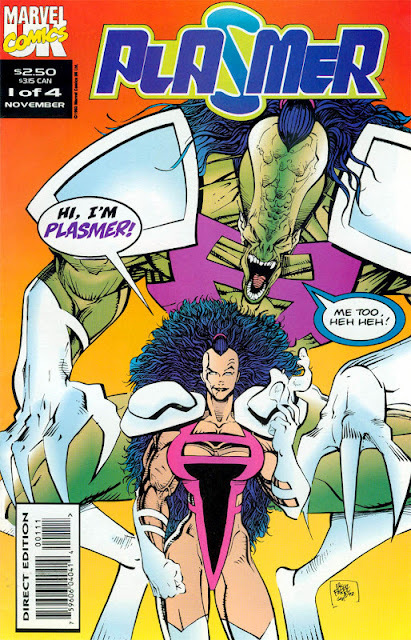 Announced as a four issue limited series, by Bambos Georgiou (W) and Henry Flint (A), beginning February 1994 but subsequently cancelled. Published as part of the PUMPING IRON sub-line. Spin-off from MOTORMOUTH AND KILLPOWER. Issue 1 had a foil-enhanced cover. Relaunched as THE KNIGHTS OF PENDRAGON volume 2. 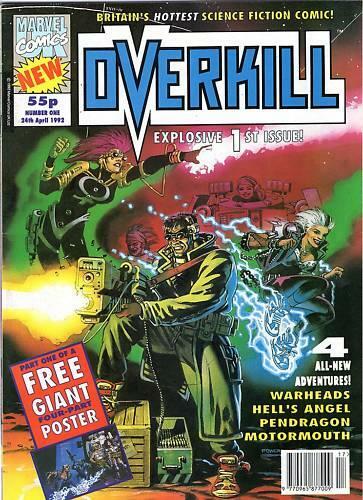 Abbreviated reprints (removing the majority of Marvel US characters) of the early issues appeared in OVERKILL. Issue 12 was a MYS-TECH WARS crossover. 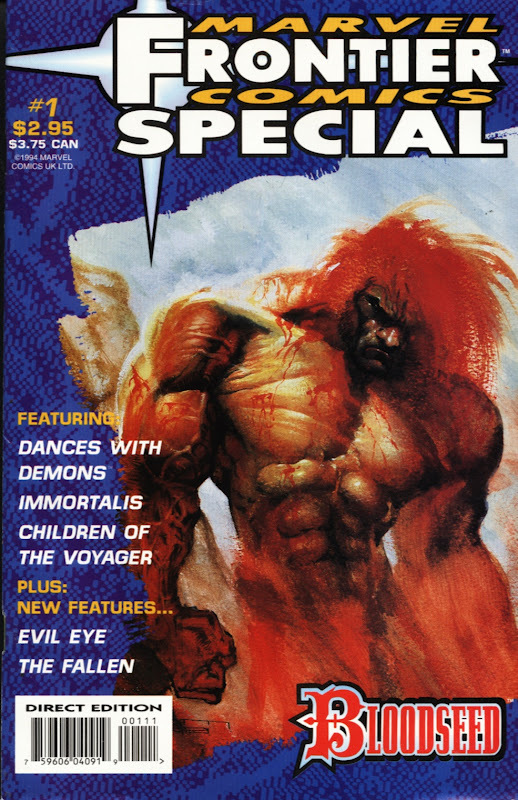 Announced as a four-issue fully-painted limited series “featuring a genetic romp through Earth's pre-history” by Carl Critchlow (COMICS INTERNATIONAL 38, December 1993). Subsequently cancelled. This fully-painted WARHEADS spin-off was almost completed when M-UK closed the US line leaving the work unpublished. It's subsequently been made available online (although not by Marvel/ Panini). Becomes MOTORMOUTH AND KILLPOWER from 4. The MYS-TECH WARS storyline begins in 9. An edited version of the strip (removing US heroes) appeared in OVERKILL. The complete versions appeared in THE EXPLOITS OF SPIDER-MAN. Several other Motormouth projects (see seperate entries) were planned but abandoned). 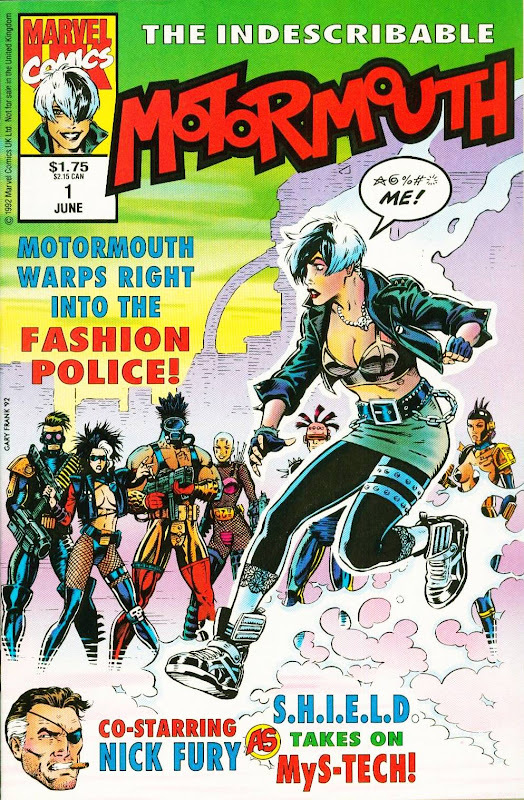 MOTORMOUTH also appears in THE INCREDIBLE HULK 408-409. The announcement of delayed publication appeared in COMIC WORLD 22 (December 1993) and then cancelled when M-UK pulled the US line completely. Issue 1 solicited in MARVEL AGE MAGAZINE 129 (October 1993). An alternative take on the Marvel Universe: Spider-man is a Vietnam Vet, The Punisher is an evangelist and Captain America as a sadistic villain. Part of M-UK's US line. Creators: Rafael Marin (W) and Carlos Pacheco (A). 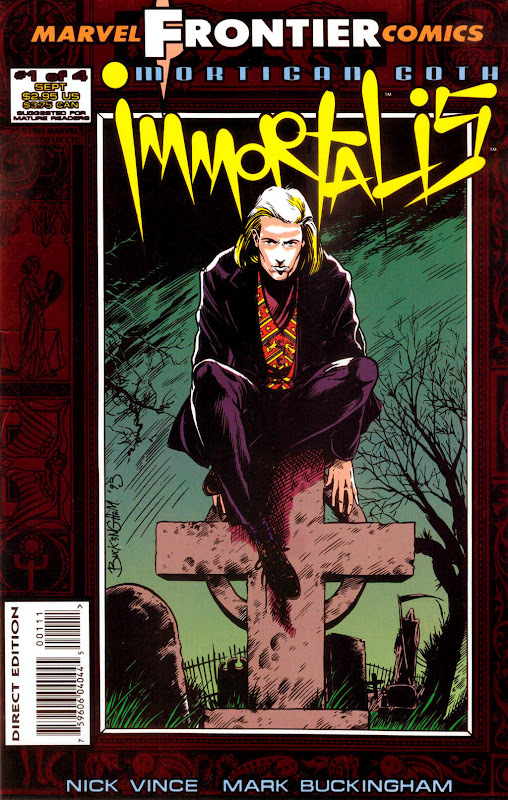 Announced as beginning March 1994 but canceled (COMICS INTERNATIONAL 38, December 1993). 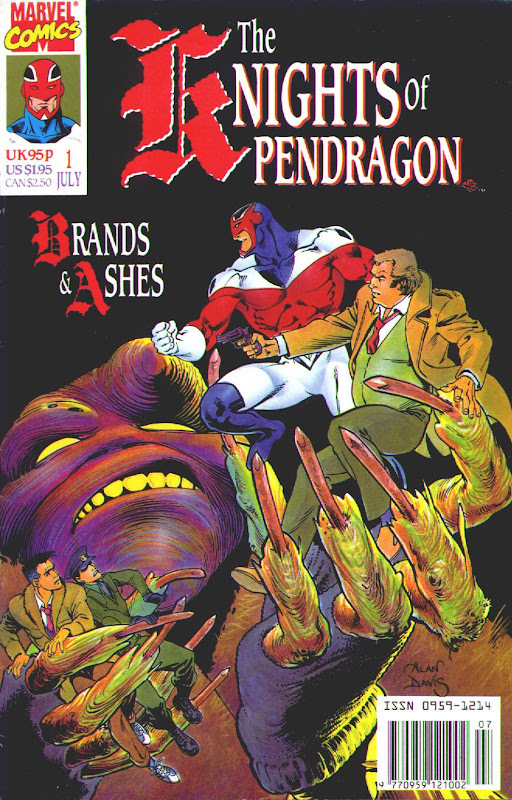 Line-spanning mini-series with cross-overs. Issue 1 has gatefold cover. OFFICIAL CROSSOVERS: MOTORMOUTH & KILLPOWER 9, DARK ANGEL 10 & 11 (May/ June 1993), DEATH'S HEAD II volume 2 issue 5, WARHEADS 11, KNIGHTS OF PENDRAGON volume 2 issue 12. An updated version of NIGHT RAVEN. Planned US format comic. 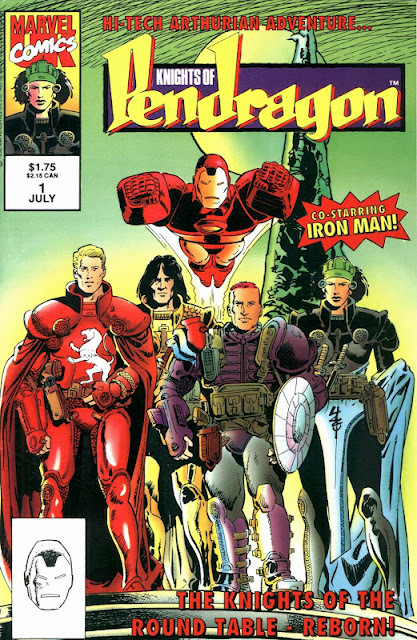 The project was abandoned when Marvel UK was taken over by (fellow Marvel subsidery) Panini in 1995. Creative team (announced in COMIC WORLD 20, October 1993): Glenn Dakin (W) and Ross Dearsley (A). The announcement of delayed publication appeared in COMIC WORLD 22 (December 1993) and then cancelled when M-UK pulled the US line completely. 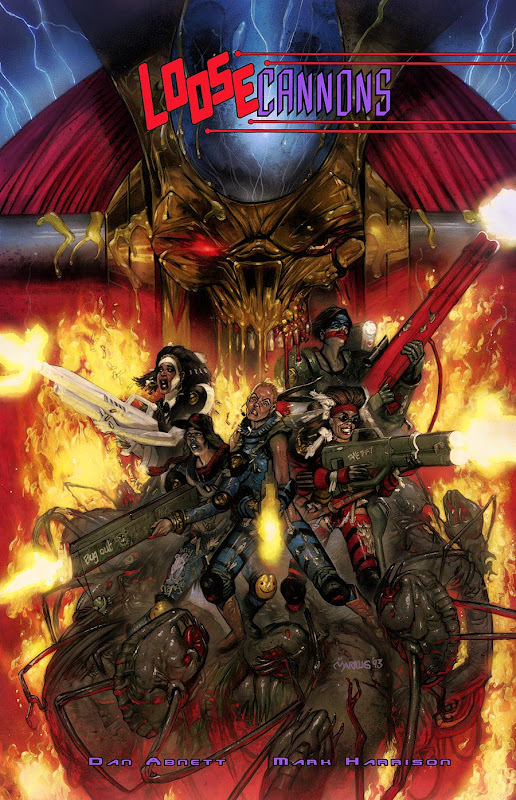 UK anthology outlet for selected US format M-UK strips, initially the GENESIS '92 line-up (KNIGHTS OF PENDRAGON, DIGITEK, WARHEADS, MOTORMOUTH, HELL'S ANGEL/ DARK ANGEL). Later strips included BLACK AXE, DEATH'S HEAD II (from 12) and SUPER SOLDIERS. 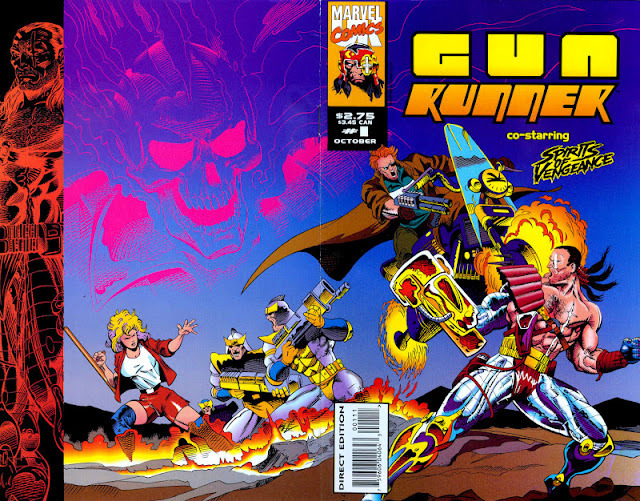 Strip pages featuring (sales-boosting) appearences by US characters were initially omitted from Overkill. Initially developed as FAST FORWARD. M-UK trading cards cover-mounted to 12-14. New look and logo from 30. Monthly from 43 (cover-dated 15 December 1993). Relaunch accompanied by 3D glasses and M-UK character trading cards (not available elsewhere). Further sets of cards in 44-45. The decision to cancel was clearly hasty, albeit announced, as reprints of BATTLETIDE II started in issue 52 and were never concluded. UK edition. Collects the four-issue BATTLETIDE limited-series. The only OVERKILL spin-off. Umbrella brand for Marvel UK summer 1993 launches BATTLETIDE II, KILLPOWER: THE EARLY YEARS and DEATH'S HEAD II & DIE CUT, all edited by Jacqui Papp. 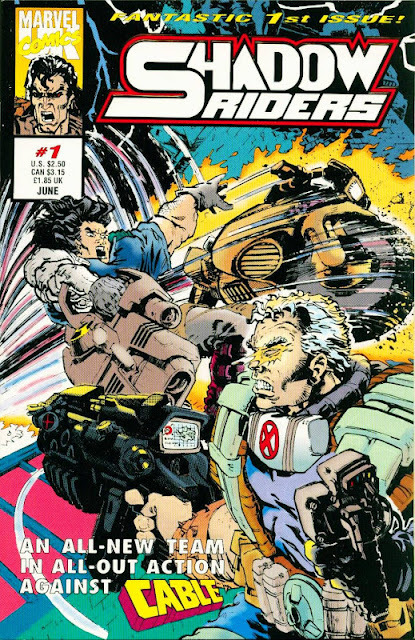 Supported by a cover feature in COMIC WORLD 16, June 1993. Four issue limited series by Dan Abnett, Andy Lanning (W) and Bryn Hitch (A). Announced for first-quarter 1994 (COMICS INTERNATIONAL 38, December 1993) but subsequently cancelled. 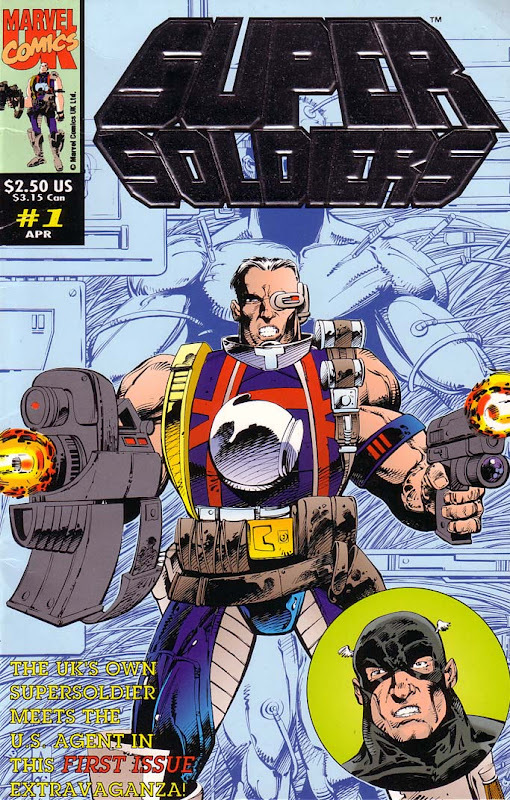 SUPERSOLDIERS 8 (published) was a tie-in. Creative team (announced in COMIC WORLD 20, October 1993): Glenn Dakin (W) and Pedro Espinosa (A). 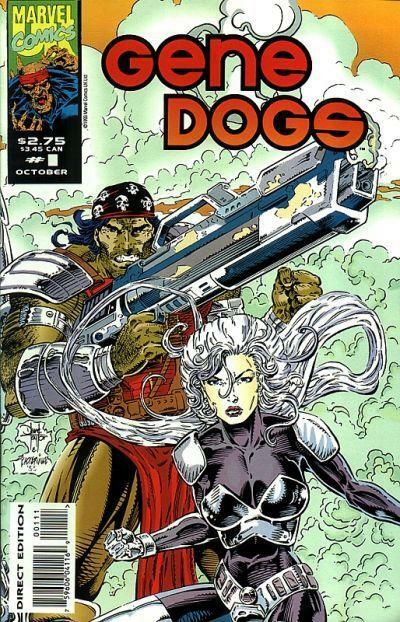 The announcement of delayed publication appeared in COMIC WORLD 22 (December 1993) and then cancelled. Creative team (announced in COMIC WORLD 20, October 1993): Craig Houston (W) and Stuart Jennett (A). 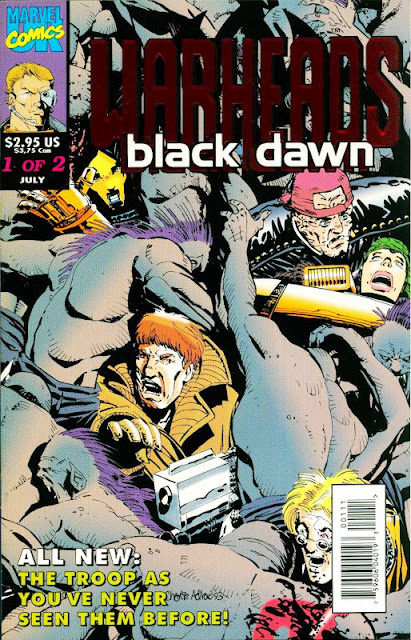 The announcement of delayed publication appeared in COMIC WORLD 22 (December 1993) and then cancelled. 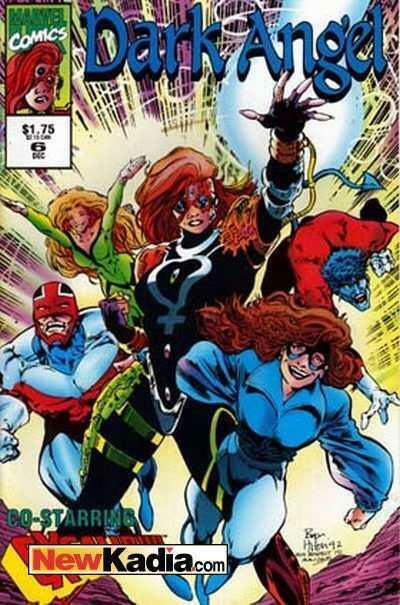 The announcement of delayed publication appeared in COMIC WORLD 22 (December 1992) and the title was cancelled when M-UK pulled the US line completely. 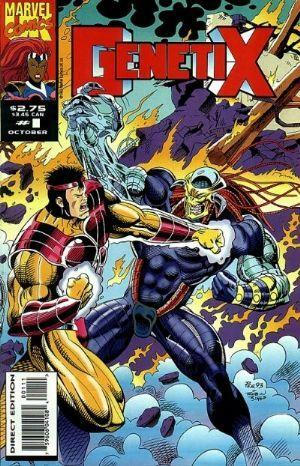 Issue one solicited in MARVEL AGE MAGAZINE 130, November 1993. Announced for 1993 but unpublished. Described by Michael Bennent (Frontier Group Editor) as “humour-based title about six hot babes in space” (Interview in COMICS WORLD 17, July 1993). Contained full reprints of MOTORMOUTH. 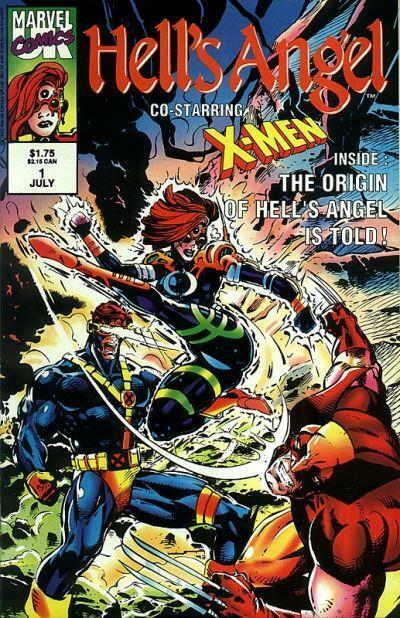 Issue one's (with foil-enhanced cover) sales: 200,000+ (source: COMIC WORLD 13, March 1993). Issues 9-10 were solicited in MARVEL AGE MAGAZINE but never published. The exterior of the Super Soldiers base closely resembled Marvel UK's Arundel House. The announcement of delayed publication appeared in COMIC WORLD 22 (December 1993) and then cancelled. Abbreviated versions appeared in OVERKILL. Issue 11 is a MYS-TECH WARS crossover. Creative team (announced COMIC WORLD 20, October 1993): David Leach, Jeremy Banx (W) and Carlos de Miguel (A). The announcement of delayed publication appeared in COMIC WORLD 22 (December 1993) and then cancelled when M-UK pulled the US line completely. Issue 1 was complete and issue 2 in progress when cancelled. Sales for issue 1: 315,000 (Source: COMIC WORLD 13, March 1993). Issues 8-11 were solicited in MARVEL AGE MAGAZINE but never published.